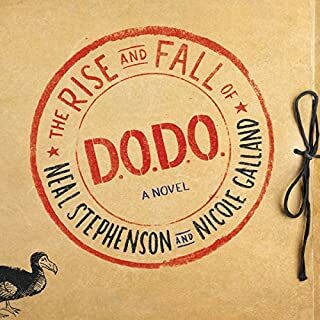 Would you try another book from Neal Stephenson and Nicole Galland and/or the narrators? This was not my favorite, but it was fun and it held my attention. The book is written entirely in the form of documentation produced by various characters. The first act of the book is entirely composed of a single document written by one character, so the book feels like a familiar first-person perspective story. Later, the book shifts to documents written by other characters, and that familiarity breaks down. Much of the later sections contain chat logs and IM transcripts. The two main characters are Melisande Stokes, who specializes in ancient languages, and Tristan Lyons - a military man who loves science. I found this paralleled the dual authors Nicole Galland, who I understand specializes in historical fiction, and Neal Stephenson, who takes joy in writing about science, technology, ancient warfare, and specifically money (as a technology). I suspect the writing duties fell mainly on Nicole Galland, but I would start to hear Neal Stephenson's voice in the ruminations of Tristan, and later any character who needed to explain technology or swordsmanship. Also, I am pretty sure Neal Stephenson wrote the epic poem towards the end that features the viking sacking of an unconventional target. Like most books, I read this partially on my Kindle and partially as an audio book on Audible - my preferred way to consume a book, as I can read comfortably in a chair after work, and then continue over audio while driving. The audio presentation featured a full cast, which is wonderful, though often one character was speaking through another characters document, so different performers would read the same character depending on the document being read - which was kind of... unsettling. Also, the chat logs necessitated a name and timestamp on every reply, which crippled the rhythm when the replies were brief. Any fan of either of these authors is probably going to enjoy this book. Also, it would appeal to fans of time travel and those who enjoy blurring the lines between fantasy and science fiction. 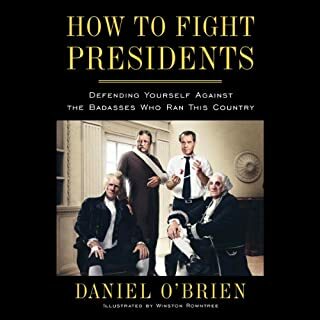 I wish Dan O'Brien would have narrated this himself. He does read the intro and tells us not to worry as the book will be read by someone who knows what they are doing and doesn't stutter. However, people who find and read this book are probably Daniel O'Brien fans and enjoy his voice. That is not to say that Richard McGonagle did anything less than spectacular work. He nailed all of the gags in a voice that manages to be an impossible mix of a DO'B impression and booming authority. Content wise, this book met all of my expectations, providing interesting facts, wonderful jokes, and a perspective to history that acts as a bonding agent for knowledge. Who knew that William McKinley was so sweet?